At Grosse Pointe Auto, we love vehicles of all make, model, and stripe. Regardless of the mechanical problem your vehicle may have, our technicians will work diligently and with all the care they'd give their own cars, trucks, and motorcycles. We have particular experience with classic and collectible automobiles, as we've made vehicles a hobby and point of pride as well as a profession, and love the opportunity to work with great machines. 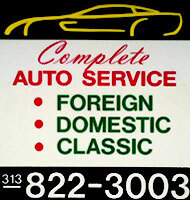 At Grosse Pointe Auto, conveniently located on Kercheval Ave (in the Park), we are focused on all of the mechanical aspects of your vehicle: Lube, Oil & Filter, Brakes, Tires, Mufflers & Exhaust, Engine & Tune-Ups, Heating & Cooling, Steering & Suspension, Transmission and Batteries & Electrical. Contact us today! Dwayne, Yvette and the entire team of Grosse Pointe Auto look forward to servicing your automobile repair and maintenance needs.